Andrew Jackson Downing was an architect and landscape designer who planned out the grounds of the White House and the Capitol. Today's National Mall looks more like what was originally proposed by Pierre l'Enfant, but until the 1930s, part of it was laid out in a plan designed by Downing. Everyone who enjoys a stroll through a park owes a debt to Downing. He was an advocate for public parks and green spaces. 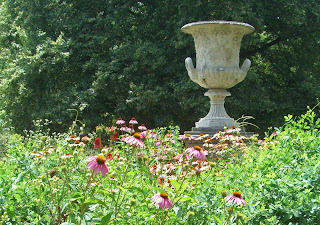 A marble urn dedicated to Downing rises out of a circular plot behind the Smithsonian Castle. In high summer it’s surrounded by masses of coneflowers. I like to stop and pay my respects to the man who helped promote the idea that we all should have parks to enjoy.